Are you in a relationship with someone who has anxiety? On average, 1 in every 4 adults you meet suffer from anxiety. Unfortunately, many people live their whole life with this disorder, never taking the proper steps to address it and care for themselves. Anxiety can also be very difficult on a relationship – filling a person with feelings of inadequacy, doubt, and overwhelming fear. Your job is not to fix them! But you can certainly be an irreplaceable support system – empowering them, motivating them, and encouraging them to get the help that they need. 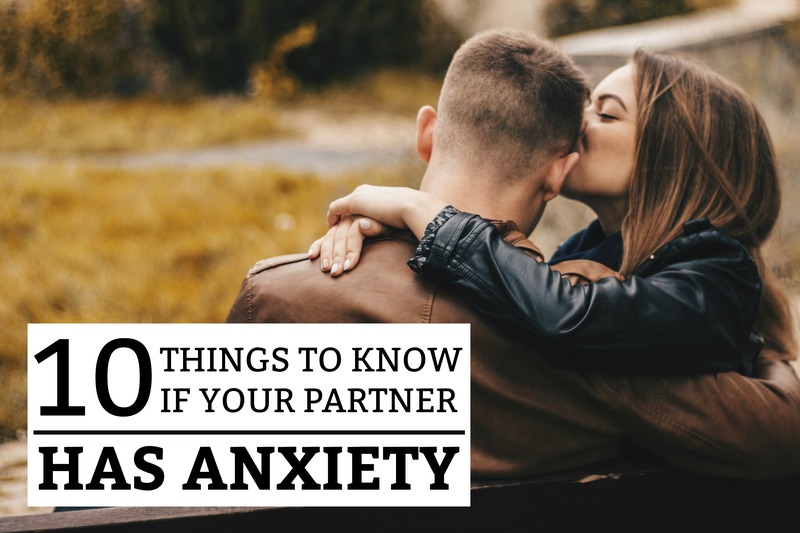 Below are 10 things you need to know if your partner has anxiety. If you are reading this article, there is a pretty good chance you want to learn about your partner’s anxiety. A lack of knowledge in this area always leads to frustration, confusion, and guilt (on both sides). Research and learn about the anxiety disorder. What is anxiety and what symptoms should you expect to see? What role can you plan in helping them manage it? Although you can’t understand what it is like to have a panic attack or suffer from unexplainable anxiety, you can be the most amazing supporter they have! Knowledge is power. When you arm yourself with the ‘head knowledge’ of what your partner is going through, it will make you a lot less confused about the situation. You don’t have to always offer solutions. Sometimes, you just need to sit still and listen. I’m sure you know that communication is the key to every successful relationship. It is also an incredibly important part of helping a person with anxiety. Anxiety isn’t a one-time conversation. You need to take their thoughts and feelings seriously, and let them know that you are willing to listen and empathize. 3.) CONSTANTLY ASKING, “ARE YOU OK?” ISN’T HELPFUL! Think about it. If you were chronically ill and your partner was ALWAYS saying, “Are you OK?”, how would that make you feel? You can probably sense if your partner is feeling anxious in that moment. So instead of asking if they are simply OK, ask them an intentional question – what you can do for them right now. Can you imagine telling someone a deeply kept, personal secret – only to find out that they went out and told everyone! Although anxiety is openly talked about today, many people are still judgmental and uneducated on the issue. When they find out that someone has an anxiety disorder, they may start to treat them different or try to give them unnecessary advice on the subject. Imagine how violated and disrespected your partner will feel when they find out that you have told your friends and family about their anxiety disorder. Unless you are given their express permission, keep it between yourselves. If you are in public and need to see if their anxiety is ‘acting up’, have a keyword or secret phrase that only the two of you know. Remember, the final decision is up to them! Whether they want to remain private about their anxiety or not. In many cases, people have anxiety triggers! Perhaps it is a stressful job, a toxic relationship, excess caffeine, large social events, skipping meals, or unrealistic goals. Learning to identify your partner’s triggers in an important step in helping to manage them. Don’t pressure them to go to a party if they feel anxious at large social events. Always have a snack on hand. When they don’t eat, their blood sugar drops. In some people this triggers anxiety. Encourage them to find a new job, if their career choice is stressful and consistently triggers uncontrollable anxiety. Being able to identify your partner’s triggers can make a big difference in your relationship! When you love someone, you are willing to make some changes and adapt to their needs. Many people with anxiety never take proactive measures to seek outside help. Unfortunately, this disorder is often seen as something to be embarrassed of and hidden from other people. It is important that YOU as the partner know that they do not need to go through this alone. Some people are very tentative and nervous to go to therapy or join a program. Perhaps you can suggest couple’s therapy or a family-based treatment program. Many mental health professionals actually prefer this route! If the partner is supportive, they can get involved in the therapy and assist their partner in anxiety-reducing techniques. Believe me, they already feel bad enough! Anxiety has a way of making a person feel deeply flawed ridden with guilt. Sadly, they feel guilty for putting you in a position where you have to be with someone who has anxiety. They feel like there is something deeply wrong with them. Often, they feel like they are trapped inside a life of unending misery. You should never purposefully say anything that adds to their already-heavy burden. No, they are not always negative. They are not being irrational or dramatic. Anxiety can come out of nowhere and consume every part of them! Be there as a loving support system. Genuine love and understanding can go a long way in making them feel whole and accepted. Every time they have a panic attack or their anxiety is triggered, do you start making suggestions for treatments and possible causes? You may actually be the one who is inspiring the anxiety or panic attack! Of course you want to help ease their suffering. But don’t turn your relationship into a wild goose chase for remedies. Both genetics and environmental factors can play a role. Often, there is no ‘remedy’. It is simply a part of who they are. Instead, take the advice given in #1 and #6. Educate yourself, without consistently talking about it with your partner. Then, lovingly and casually encourage outside help. Your job isn’t to fix them. It is to be a loving support system. When you are in a relationship with someone with anxiety, it is easy to get caught up in all the emotions and feelings that they experience. If there is a lack of intentional boundaries, you may feel like you are living in a world of difficult extremes. Your partner’s anxiety disorder isn’t yours to suffer through. You need to remain healthy and strong for them, and yourself! If one of your partner’s triggers is something that you absolutely love, you don’t need to give it up! You can ask a friend to join you or go out for some “me time”. The best thing you can do for your relationship is to maintain a healthy and positive outlook on life. As a result, you will be a breath of fresh air to your partner, while maintaining your sense of self. The last thing your partner wants is for their anxiety disorder to start negatively effecting you! As they watch you lose your sense of self, their guilt will intensify. If you are in a relationship, you are dedicated and deeply in love with each other. You want the best for each other. This is why you need to prioritize your needs and concerns over everything else. If you lose your sense of of self and stop doing the things you enjoy, it can easily take a toll on your relationship. Always know that there is professional help for you too! Your well-being is just as important as your partner’s. Anxiety is a very normal and common disorder. And because of this, there are wonderful resources out there to help someone manage it! Be a that necessary support system that your partner needs. But always remember that you need to take care of yourself!